Well here it is Feb 10 2007 and the last of eight blooms on the Phal. just fell off BUT in the mean time another shoot sprouted and is taller than the first and has eight more buds! I wanted to tell you that I received my new orchids on Tuesday and I couldn't be happier! They are gorgeous and the healthiest plants I have ever seen. They shipped beautifully, not a single problem. I just love the dragonfly clips on the Phal. So cute!! Everyone in the office has commented on them and admired the plant. (I'm keeping the Paph at home, I just love it in my formal living room). They, along with me, can't wait to see the flowers when they bloom. I actually think I've converted a few to consider owning one of their own. I think that most people don't realize that there are some varieties as easy to grow as any houseplant. Thank you for all of your pre-order help. Excellent customer service like this is a rarity anymore. Thanks! And Happy New Year to you, too. Incidentally, I love your pots. I saw on ad in the AOS Orchids magazine a couple months ago and ordered the "three for the price of two" special in one of the larger sizes. I planted three Pragmapediums in them and it is already possible to see that they are much happier than they had been before being grown in regular pots under lights in the dry house. I think one of the great virtues of your pots is for home orchid growers, who always have a problem with keeping the plants humid enough as well as wet enough--but not too wet! I have been using the hydroculture system from Interior Water Gardens for the past nine years. With the help of Ann Lerman, the owner, I am successfully growing over 100 hundred orchids under lights with much less care, effort and problems then growing in what some consider the now conventional methods. I have had virtually no problems and my orchids (mostly phals, mini-catts and paphs) have bloomed successfully year after year. I have left them unattended for two weeks while vacationing with no damage. Repotting is very simple. I highly recommend this system to anyone who wants great success growing orchids or any plants with little effort. WOW , anyone can repot orchids now. I wish I had done this years ago. I`m a believer. Expect more orders from me. I AM VERY PLEASED WITH THE PLANTS I HAVE BUT INTEND TO VISIT YOU SOON FOR ADDITIONAL PURCHASES. DearAnn, I really like your site. 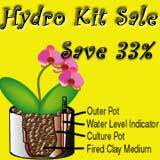 I have been telling via e-mail about my success with your hydro-pot kits. Keep up the good work. 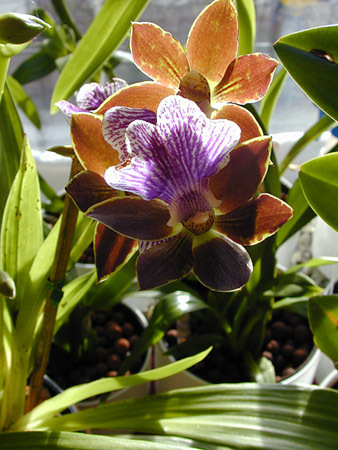 I think that if you went to some shows( perhaps you already do this) with some beautiful blooming orchids in you pots that you would drum up a lot of business not only for long time orchid lovers but beginners and folks that want to grow orchids but don't have a lot of time to spend taking care of their plants. Be well and good growing, Ed C., Evanston, IL. I have purchased Hydro Kits from you in the past. I am pleased to tell you that a dendrobium that I transplanted into one of your kits has bloomed for me within the past two weeks. The other orchids and house plants are doing well, too. happy, healthy orchids, blooming their brains out---this is GOOD! make them believers in the wonders of hydroponics. Thank you for all the help and information! Thank you too, for the wonderful condition in which every single orchid you have shipped to/for me has arrived. I'm happy to tell you that we're creating new 'orchid-a-holics' every time I send one! Well, as "they" say: Orchids ARE very addictive! I am fond of not having to worry about watering so much! Several of my orchids are kept at work, under a skylight, but they would always dry out, and whatever I did, I couldn't keep humidity around the roots as needed. Now I don't have to hassle with it anymore! It's GREAT! I've had the plants in hydroculture for about a month now, and have only had to water ONCE! Thanks very much! I saw your ad in an Orchids magazine and thought I'd check it out. Here I am, 60+ orchids all in hydrokits, 4 months later! I just wanted to let you know how pleased and happy I am with the hydroculture pots I bought from you over the Thanksgiving weekend and subsequently a few days later over the phone. My orchids are thriving. My once droopy phaelopsis and dendrobiums are bouncing back to life, and the guess work of when and how much water to use is but a memory. This watering method system has made me a fan and believer of growing orchids (and indoor plants as well) using hydroponic systems and hydroculture. I've begun to read books on the subject and study how to grow plants using the soil-less system. I'm very excited and encouraged by all I'm learning. This has made orchid growing and gardening fun once again. Now I can concentrate on "growing" plants once again and enjoy the fruits of my labor rather than worry about what to do with my plants. Thanks to you and Pilar for all your help, and know that you have a happy and satisfied customer in me. Next time I'm in Barnegat or close to you guys, I'll be sure to stop by and pick up more pots to fill up with great looking plants. Enjoy the holidays! PS. Here's my latest blooming beauty! A zygopetalun hybrid I've transferred to a hydrocultre pot. Is she not beautiful? Hope you enjoy it as much as we are!